According to a recent news feature form FierceBiotech, the National Institutes of Health (NIH) have just agreed to provide $3 million to a biotech firm that is developing portable brain monitoring system. The lab opened three years ago and is working on products that are portable and will be able to scan for signs of traumatic brain injury (TBI), dementia, and a type of stroke known as acute ischemic stroke. The technology was originally being developed by UCLA, and the biotech company licensed the rights to it and is working to design a line of commercial models for sales to various consumers. While the wearable device is already in working order, before the company can market it, they must complete a series of clinical trials, and this grant will allow them to get those studies underway. The device itself is technically a wearable ultrasound system. The ultrasound waves are capable of detecting irregularities in the brain consistent with a traumatic brain injury, ischemic stroke, or dementia. The company says that one of the primary users of this product will be emergency departments, where a patient can be fitted with one of these devices as a form of triage to determine if they have one of the brain injury conditions. 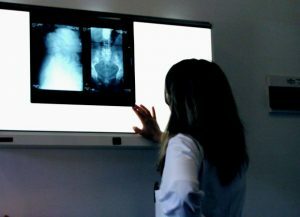 This will allow patients to get into treatment much quicker, as they will not have wait for imaging rooms to free up or larger portable scanners to be brought down. It has been well documented that the sooner a patient gets into to treatment, the better their chances of making a full recovery. They also believe that first responders will be able to take the devices into the field, so they can diagnose a patient with a possible brain injury as soon as possible. This will help determine the initial course of treatment and will also help EMTs know whether they need to call for a medevac helicopter instead of transporting the patient via ambulance. In addition, the emergency room doctors will have advanced notice to prep for a brain injury patient, and surgeons can be on call sooner. As we have seen from the many head injuries in Iraq and Afghanistan to both soldiers and civilians, urgent access treatment is the most important factor and increases the chances a traumatic brain injury patient will recover. One thing to keep in mind, as our Boston personal injury attorneys have seen in various cases, is even the most successful treatment of a traumatic brain injury case will likely result in a patient left with considerable pain and suffering and long road of recovery. A patient may even need to relearn many basic tasks such as eating, walking, basic motor control skills, and language skills. This will involve a lot of rehabilitation sessions and possibly the need for the patient to stay at a rehab facility long term or have home healthcare workers come to a patient’s home for years to come. This can be very costly, but this can be included in the measure of damages in a brain injury case.